The worst thing satire can be is predictable. Some types of humor work by fulfilling expectations in highly predictable fashion—mostly jokes like a character saying something along the lines of, “I’ll never fly again!” followed by an immediate cut to them white knuckling the armrests on a plane—but pointed political sendups definitely don’t work that way. The best satire teaches something and sends the viewer away with new questions, which it accomplishes by placing familiar dynamics, people, and symbols in new, surprising, often heightened contexts. This is also why most satire is bad—being fresh is hard, especially when everyone thinks of the same few jokes about every political dustup. Tonight’s Boondocks follows through on almost all of the easiest jokes inherent in its premise, and while some of them still manage to be funny (largely by following through on some of our expectations), the majority of “Freedomland” manages to take a solid premise and fritter it away. That premise—that the Freemans have become slaves playing slaves at a giant historical amusement park owned by Eddie Wuncler—is the logical conclusion of the end of “Good Times.” We’ve spent the last few filler episodes watching Robert try in vain to make back the money he owes, waiting for the other shoe to drop, and drop it does. The perhaps too-pointedly named Freedomland is something out of a George Saunders story—a giant, horrifying consumerist monstrosity transmuting horrible experiences for millions of people into a well-marketed product for the entertainment and distraction of others. (I’m especially thinking of CivilWarLand In Bad Decline here.) The idea that tons of people would actually pay for the pleasure of whipping slaves or shooting water pistols at a face-painted black child in a “historical” setting is both intriguing and discomforting, which makes it perfect for this show. But other than the occasional glimpses of happy families enjoying the premises, the episode is focused squarely on the plight of the Freemans without considering the broader implications of a world in which Freedomland (and the slavery required to fuel it) can actually exist. At least we got a Huey episode, though! “Freedomland” is the biggest showcase the character has had all season—he even provides narration. But Rodney Barnes uses Huey as a mouthpiece for complaints about the one percent and to agitate for a slave revolt that seems almost perfunctory as the conclusion of the episode, without couching his actions in any of the specific things that make him more than a collection of stereotypes. Somehow, Huey has the most action he’s had in a while in this episode and still seems like a nagging buzzkill in elements like his clunky, ham-handed voiceover describing Robert’s current state: “What was once a productive senior citizen is now reduced to a couch potato.” For all that I’ve been agitating for a Huey episode, maybe I should have clarified that I wanted a good Huey episode, one that treated him as more than a collection of platitudes and karate kicks—kicks which aren’t even that great, though we’ll get to it later. It’s not like the other characters fare too much better, with the exception of Robert, who manages to show some spine (even if he also utters a cowardly “Yeah, boy!”) and actual paternal instinct toward his grandchildren. Tom, who actually applies to be a slave, has been taken to pretty much the literalization of his namesake—his interactions with Ruckus just skirt being explicit with this, especially when he abandons the Freemans after Sarah buys his freedom (I wish that reunion had taken place in the episode). Ruckus is, in turn, another problem, as he has been all season. His continued assertions to the Freemans that he won’t hesitate to shoot them violate his established characterization, especially his genuine belief that white people know what’s best for black people—he argues vociferously for the greatness of Freedomland at the end of the episode, but proves more than willing to kill the people he’s supposed to be helping. Ruckus has been a bit of a problem all season, becoming increasingly one-dimensional (and wasn’t he mayor a while back?) until he just spots the most racist things possible. The specificity of Ruckus’ sad situation (and the odd, unique places his hatreds took him) was what made the character special to begin with. In that vein, Tom’s worry about breaking his “amusement park character and this fantasy space-time continuum” suggest that he had an entire character created, with a fleshed-out history. “Freedomland” would have been well served by this level of attention to detail, making the characters more than just their archetypes. Sometimes, that barely-sketched quality works, as it does for the overbearing white villains. Ed Wunclers I and III have always been the best white characters on the show, attaining a level of uniqueness largely through the power of their vocal performers (the existence of Eddie suggests that Charlie Murphy and Ed Asner jumped ship this season, however). The big council meeting toward the end of the episode is decent, though ridiculously spot on with lines like, “We tried that at the Indian section. That’s why we had to go to court and build that damn Trail Of Tears casino.” The things Eddie offers to Huey are not-so-subtle digs at certain elements of black culture: “a month’s supply of overly branded clothing,” “your pick of our obese women,” and finally, a literal offer of 40 acres and a mule. These are all good for cheap laughs, but the way the characters act as if they’re not aware of the historical significance of their words and actions is just bizarre, and contributes to a sense that everyone is just a little dumber than they ought to be. That contributes to the preponderance of somewhat wasted striking images in “Freedomland,” especially the circle of (largely white) slaves singing while Riley complains about his “work” at Freedomland and the eventual slave revolt. There are at least a couple of moving parts in play here, but the plan slows down in the middle of chaos to focus on Huey fighting (all black) cops just so the scene can exist. That fight scene isn’t even particularly imaginative—it lacks the flair of the obvious anime influence in some of the series’ better fight sequences, which have always been more visually striking than enjoyable purely for watching people beat each other up. 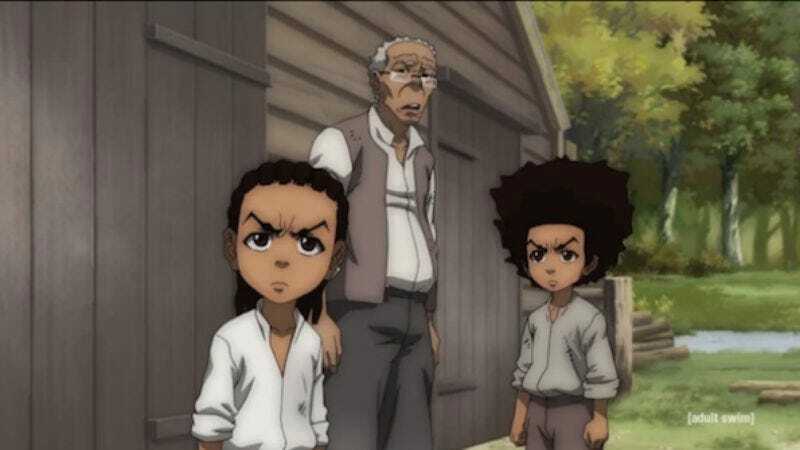 Without the ability to really turn in a snappily directed action sequence, The Boondocks is left conforming to expectations yet again. If there’s one way in which “Freedomland” does subvert expectations, it’s by not following through on what would have been its most predictable ending—the Freeman family safely back at home, watching TV, after all of Huey’s warning. In some respects, the script for “Freedomland” appears to have been written solely to justify the actual final exchange between Huey and Ruckus. “Tell me you ungrateful bastards, what could ever be greater than Freedomland?” “Freedom.” With better execution, the soaring aspiration of this conversation would have fueled the end of an all-time classic. Instead, it’s a slightly disappointing end to a decently disappointing arc on a majorly disappointing season. 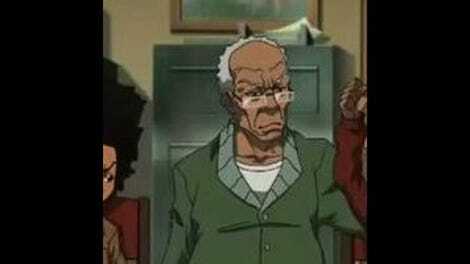 A throwaway comment gives The Boondocks the dubious honor of joining Family Guy to mock The Cleveland Show this month. I continue to love the funky music theme the show uses whenever Eddie is onscreen, even if it’s a little heavy-handed.